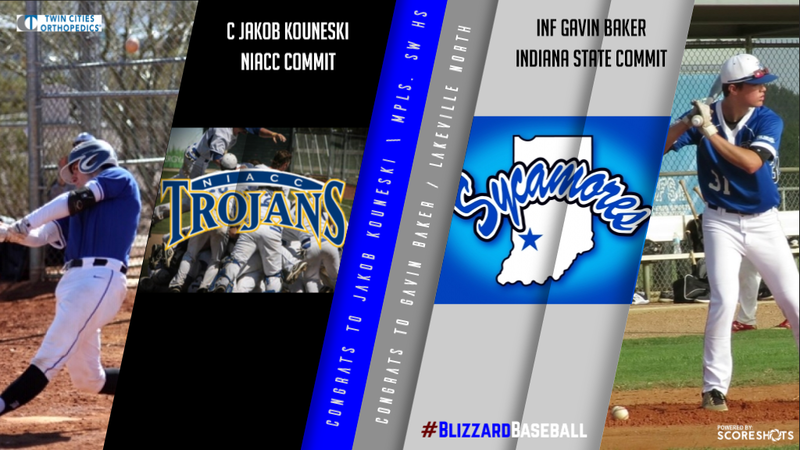 INF Gavin Baker (Indiana State) and Jakob Kouneski (NIACC) commit ! Catcher Jakob Kouneski (Minneapolis SW HS) and infielder Gavin Baker (Lakeville North) have committed to Northern Iowa Area Community College (NIACC) and Indiana State, respectively. Both players have played in the Blizzard program for just over five seasons and helped lead their 2019 Minnesota Blizzard Elite team to a 3rd consecutive trip to the WWBA World Championships in Jupiter, FL going 2-2. They also helped their team to a top-40 ranking in the country before finishing their respective careers in the Blizzard program helping their teams to over 155 wins. We sat down with 'Jako' and 'G-Bake' to talk about baseball, recruiting and their advice to some of the younger players coming through the Blizzard program. What were some of the factors in choosing your school? Kouneski: Some things that put NIACC ahead of other schools for me was the coaching staffs passion for development along with their use of tools and technology. Their advancement in biomechanics provides a really good opportunity for development, which was the biggest thing I was looking for in a juco program. Baker: Some of the main factors for me in choosing the school was the great coaching staff as they are very good at developing players and infielders especially. And also the culture there is great too. What schools were you considering? Kouneski: I was also considering Valparaiso, Indian Hills, and Odessa CC. Baker: I was considering Liberty and Southeast Community College. Where did Coach Hergert see you play? Kouneski: Coach Schlechter first saw me play in the (Perfect Game) Kernels Tournament and then he told Coach Hergert about me. Baker: Coach Smiley saw me in Indiana for the first time and we started a relationship after that. What is your opinions of some of the coaching staff NIACC? Kouneski: I believe NIACC's staff is one of the best in the nation. They are very personable and passionate, constantly looking for new methods of training and have repeatedly year after year coached some of the best teams in the country. Baker: The coaches at Indiana state were exactly what I was looking for their main goal is to win and that’s what they set out to do every year, but at the same time they’re also there to help you develop and that’s what was a big factor for me in that piece of the game. Where does coach see you contributing as an incoming freshman? Kouneski: Obviously all playing time is earned but they see me contributing both with my bat and behind the plate early. Baker: The coaches there see me coming in my freshman year and competing for a spot in the infield. What are you looking forward to most coming into your freshman year? Kouneski: What I’m looking forward to most about my freshmen year is just playing a lot of baseball. With juco there are no restrictions on practice time so I’m really looking forward to being able to play a lot of ball. What things do you need to do to prepare for that next step in playing in college? Kouneski: I would say just continuing to improve athletically, more specifically the biggest thing to improve upon for me is bat speed. Baker: I need to work on my fielding especially my feet and at the plate I want to work on my bat path more and also swing speed. What position are you slotted to play? Kouneski: I’m slotted to catch for them but I will probably be working at other positions at times too. Baker: I am slotted to play in the middle infield and possibly 3rd base. But wherever I get placed I’ll look to work hard to become a starter every day. Kouneski: As of right now this summer I plan to stay home and focus on development prior to college while training with Cody Beam at Tier One. Baker: This summer I’m leaving after the end high school ball right at the start of July and I will he practicing and lifting with the team. How has Eddie impacted you as a player and person? Kouneski: As a player I’ve been getting hitting lessons from Eddie since I was 14 years old, as a person Eddie has helped teach me how to have a lot of fun while playing the game. He is able to keep the mood fun and light hearted while still being serious about winning. Baker: Eddie has impacted me and the team a ton he’s really just showed us that baseball is supposed to be fun and to not get too worried about outside factors. How has the Blizzard helped you in the recruiting process? Kouneski: Through a number of competitive tournaments and workouts scheduled Barta and the Blizzard helped get a a lot of different coaches in front of our team. But more so then that just the advising through the process helped me understand what to expect and how to deal with certain things. What message would you give young (15u and under) players about the recruiting process? Kouneski: Throw hard, swing hard, and lift. Searching for looks through showcases camps etc. is not necessary what so ever at that age, the most beneficial thing you can do for yourself is work on developing tools because tools play and you will get looks from them. Baker: To the 15u and younger guys that haven’t got into the recruiting process I’d say enjoy the game and don’t let colleges affect the way you play. Remember why you play the game and that’s to have fun and to win. What advice would you give to older (16u and older) players about the recruiting process? Kouneski: I would say be patient, try to get as much out of the process as possible. My recruiting didn’t really take full steam until this fall and when it did it came fast so I tried my best to evaluate every option. Also learn to love the pressure. At some games this summer we had over 20 scouts present. At times it can be a little overwhelming but in the end baseball is baseball and if you get caught up in performing then you can lose the fun of it. Baker: To the 16u and older guys I’d say to be proactive throughout the recruitment process don’t be afraid to keep reaching out to the coaches and don’t sit back and hope that they go and call you. Because that is usually not the case. What would your advice be on showcases to players? Kouneski: I would say only do showcase when you feel like you can put forward your best product possible. Also it isn’t necessary to do showcases at a young age. The showcases I did as a sophomore ended up having zero impact on any looks or the final decision I made, but everyone’s process can be different. What have been some of your favorite moments in the Blizzard program? Kouneski: My best memories with the Blizzard definitely are just from spending time with the team. Also In game two of my favorite moments were this summer when I hit a 3 run home run in the bottom of the 7th to tie up a very good Sticks team, and this fall in Kernels where I got a walk off hit in our first round of bracket play. Baker: Some of my favorite moments in the blizzard program were on and off the field. On the field getting to play with some of the best players in the state was one of my favorite experiences and off the field getting to room with the guys and getting to live on your own for short periods of time at tournaments is some of the most fun I’ve ever had.